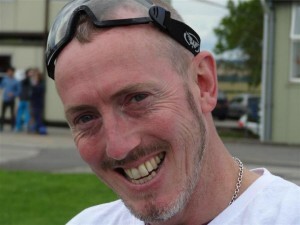 Bear-Patrol is the brainchild of local Brightonian, Danny Dwyer who initially formed the group as a way of getting a group of like minded people together for social gatherings. I created a homepage so I could keep in touch with everyone more easily rather than texting to tell them where we would be starting out on a Saturday night; that was back in 2008/9 around the same time Facebook and the whole social media concept was coming into its own. From there the social meetings quickly grew which inspired me to create the social group Bear- Patrol which is open to everybody (you don’t need to be a bear to join) and we started organising trips out. With the recession biting its teeth into the ever shrinking family budget, more and more people are looking at alternatives to get away during Easter and the summer months to come. With petrol rises hiking up the price of even the budget airlines, the idea of a holiday in the UK is becoming more and more popular. However, even a weekend break in a hotel can quickly bite into saving, so what other alternatives are there? Here are three alternative suggestions. Despite the unpredictability of the British weather, camping continues to grow as a real alternative to bed and breakfast. Of course there is the expense of a tent and camping equipment within the initial outlay to take into consideration, but once these items have been bought then the first whiff of a warm weekend and you and your family will be ready to go. 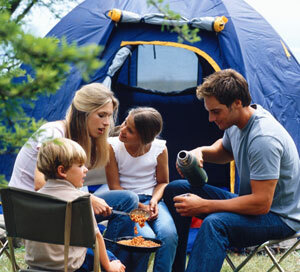 To ensure your camping adventure is a positive one consider these Six top tips. Decide what kind of camping experience you are after. Camp sites can range from the extremely organized with power points for camper/caravans, shop, showers and toilets, right to the other end where the only amenity is a water standpipe. Do buy an inflatable mattress, the choice of self inflating (thin but less time-consuming, or manual inflating (bulky but home from home comfy) is down to personal choice. This is particularly important if your camp site is a scrap of land. Save money on sleeping bags and take your pillows and duvet instead. If possible set your tent under some shade, like a tree. Tents (especially family sized) can get very hot, particularly if one of your brood needs an afternoon rest. Think ahead with your meals and be prepared. For a weekend trip away throw together a pot of spaghetti bolognaise and serve with chunks of bread. The last thing anyone wants to be doing is slaving over a stove during their holiday break. The Yogurt Room is camp site with a difference. Deer Wood Yurt, ten minutes drive from the town of East Grinstaed can make you feel as if you are much further away from all the hustle and bustle of city life, but still close enough should you wish to visit the local pubs or restaurants. What makes this camp site so special is the unique yurt accommodation. These circular tents, are both extremely roomy, high ceilings with central wood burning fires making them an ideal getter away for all seasons. There are three yurts, two accommodating six people and one accommodating eight, all available to higher, for a minimum of two night,. 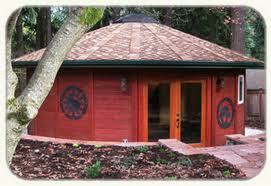 Each yurt is surrounded by woodland, with room for additional pitching of tents. The larger yurt is set in a beautiful Orchid, with enough room for 80 tents making it an ideal setting for a wedding or large celebration. It should also be noted that a each yurt has enough space in-between to ensure privacy for each party. Prices do vary depending on what time of year you are going. A weekend break in high season will cost £200. For two nights, but when that is divided between 6 people, at just over £16. Per person per night. For big events, the Yogurt Rooms also have a catering van on offer serving extremely good vegetarian/vegan cooked breakfasts, lunch and evening meals. Holiday home exchange is nothing new, but for many families it is proving to be a very cheap way of getting away from it all but still having many of the home comforts. The first thing many people worry about is letting their home out to complete strangers, but as you in turn are staying in their home, all worries that your home will be treated with respect should be put aside. There are a numbers of companies offering a home swap service, with the advice being shop around and see which company you like the best. Each company will have different pricing policies, depending on the range of houses that are on offer. So, how does home swap work? After finding a home swap company you like, you are then offered a one to three-year contract. For example, HomeLink (a higher price agency) offer a one year contact for £115. For this they will set up a page for you on their site, where you can upload up to twenty photos displaying the best aspects of your home, with your homepage translated into sixteen different languages. You in turn then have access to their large database of home swaps all around the world. Five top tips on Home Swapping. Invest in new bedding and towels, this simple touch will make a huge difference to your guests. There is no need to load the fridge and freezer up, but do ensure you have the basic to make a cup of tea for when your weary travelers arrive. Put together a folder of local places to visit and where the nearest shops are. Check out the local pub and restaurant for yourself. You may have walked past these amenities for years, but never been in. 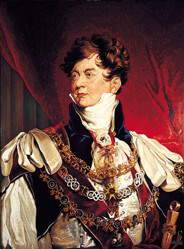 By doing so you can give a positive review, or make suggestions for places to eat a little further afield. Everyone will big up the best aspects of their home, but there is no point saying your home has original Georgian features, if all it is a ceiling rose from B&Q. Such fibbing will only be flagged up by your visitors review. So there you have it, three alternative suggestions for a break away, without tearing too much into your budget. From the moment Prince Regent drew up plans for his infamous weekend palace, The Royal Pavilion, and it’s surrounding gardens in the heart of Brighton, the city has gained itself a known as the place to go for a cheeky weekend away. However, since its promotion from a town to a city, its reputation as the place you must visit has lifted the city of Brighton above all other UK cities with many a tourists realising there is more to this little city then a stick of rock and a stroll along the prom. In fact a recent survey showed that a whopping 94% of Brighton residents live in a happy home, which reflects just what a great place Brighton is to live. 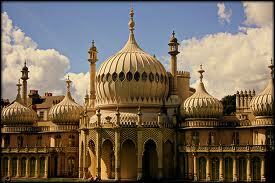 So what makes Brighton such a special place? For the people who live in Brighton and the vast amount of tourists alike, when it comes to shopping Brighton has the whole range covered. For the traditionalist, there’s Church Hill Square, and Western Road for a whole range of popular high street brands; but don’t be fooled into thinking that Brighton is just another identikit city, far from it. Just like the little islands that populate Venice, one just has to take a step to left or a jump to the right and suddenly you find yourself surrounded in a very different place. 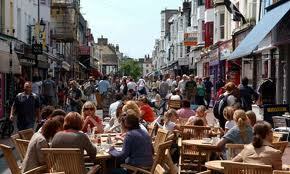 For example, there are Brighton’s famous lanes, a part of town that what many people regard as ‘the soul of the city’. Here you will find narrow winding alleyways, with the old fisherman cottages turned into an array of outstanding quirky shops, selling everything from souvenir shops, military related paraphernalia, traditional and alternative jewellery to suit every taste. Mingled around are also a host of pubs and eateries for every occasions, from a quick bite and pint to something a little more special. Across the road there are even more to discover in the North Laine, where pop art, vintage clothes, and the alternative theatre, Komedia, merge into the legendary Kensington Gardens were everything and anything can be found; from herbal remedies, vintage clothes as well as a multitude of hidden gems under the roof of Snooper’s Paradise. But perhaps the most important aspect of Brighton City has always been the way it welcomes everybody, regardless of race, creed, religion or sexual orientation. For those who come and visit Brighton they quickly realise there is something special going on 365 days a year covering all bases. From the Brighton festival, children’s parade, LGBT pride, traditional, alternative and street theatres, famous bands, up and coming bands and food fares galore. 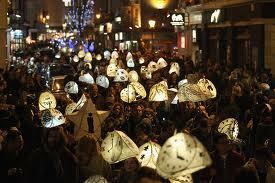 And unlike many a seaside town that closes when winter sets in, Brighton still has a few surprises. From the ‘ghost’ and ‘infamous murders’ walks, World Book Night, winter solstice Burning of the Clocks and there’s now even a Zombie March so even the undead don’t feel left out from this very special city we call Brighton. So, you have a small garden, this does not mean that you must have small plants and shrubs. In some cases having small low plants may only emphasise just how tiny the garden is. The key to creating an illusion of space is to invest in plants with some height. 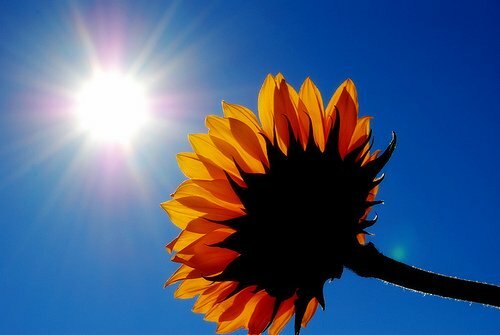 With many people experiencing a warmer climate, it is now possible to grow some more exotic plant. Bamboo for example not only brings height to your garden, but also creates excellent privacy as it can be grown similar to hedging. There are over 1000 types of bamboo in existence, but there are only two things you really need to know before you purchase this type of plant. For the small garden it is best to avoid the rhizomes of running bamboo. Although they make great hedging, their root system will quickly spread and take over. The root system is shallow, spreading across lawns, underneath patio and will quickly dominate water supplies, killing off others plants in the garden. 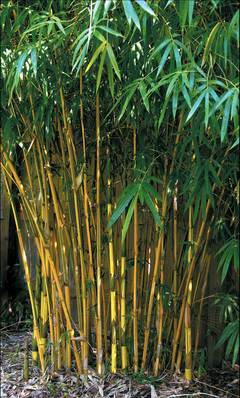 A more friendly type of bamboo for the small garden is clumping bamboo. 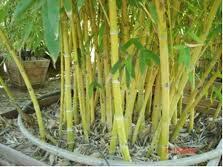 As the name suggests, this type of Bamboo grows in clumps with minimum spreading to other parts of the garden. This type of bamboo grows much slower then the running bamboo, but over time will spread in a controlled fashion. For those who wish to use containers, it is advised to either re-pot as the plant increases as the strong root system will eventually break the pot. Banana plants are another popular plant that is relatively easy to grow and manage, and can bring a real feeling of the tropics to any garden. As with most plants, they can be bought over the internet, but also check for local specialist garden centres where you can see the plant up close and choose the size and maturity that is right for you. Once planted, make sure you water and add fertilizer during the summer months. With the unset of autumn, it is of the utmost importance that the banana plant is wrapped up using a combination of straw and a quality garden fleece. Cut of the main leaves and wrap the plant including the crown to keep frost at bay. The banana leaves can be chopped up and dug into the surrounding soil allowing the plant to re-ingest the nutrients. One final suggestion for tall plants in a small garden is a bay tree. When purchasing, look for bay trees labeled, Laurus nobilis, or Bay Laurel as the leaves from these tress can be used for cooking. Other strains may be poisonous. Bay trees can be planted straight in the ground, or in a container pot. For the smaller garden, it is important to keep the tree pruned back, other wise it can grow up to 60ft. But do not let that put you off. There are many positives for growing a bay tree, as mentioned there is the culinary use of the leaves, apart from pruning, bay tress are quite happy to be left alone. Are not too fussed about what soil they grow in, but will thrive better in well-drained soil. Their root system is shallow and can withstand times of drought, but do appreciate a good soaking from time to time. 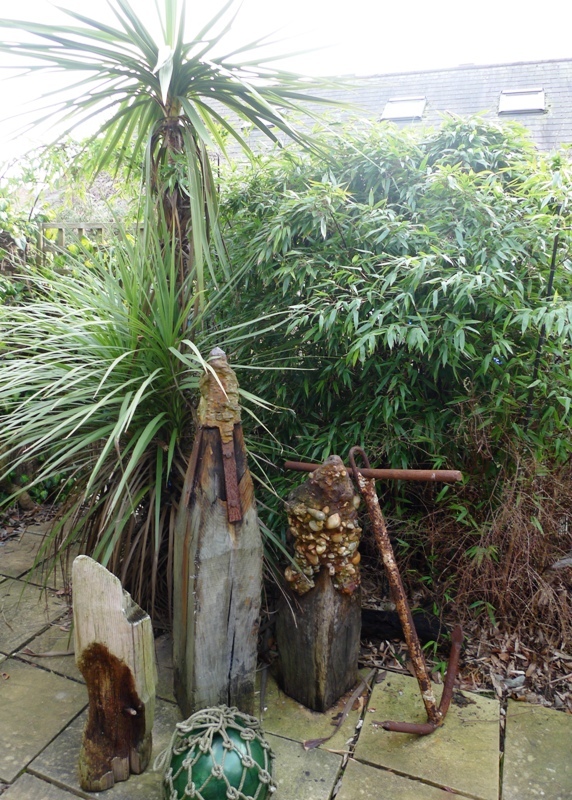 Finally, with your plants chosen, now allow your imagination to flow free by establishing a theme for your garden. Although many garden centers offer a range of ornaments, for something truly original, have a hunt round car boot sales and reclaiming yards. gather together an anchor, some chunky drift wood and old rope and your ships away! So, there you have it, three very different types of plants, that can bring height, shape and texture to a small garden, a little bit of imagination and the promise of some sunshine later on and you’ll have a small garden that is perfectly formed.